The text below serves as program notes to Ventania. The particular use of commas and capitalized letters is intentional and should not be altered. 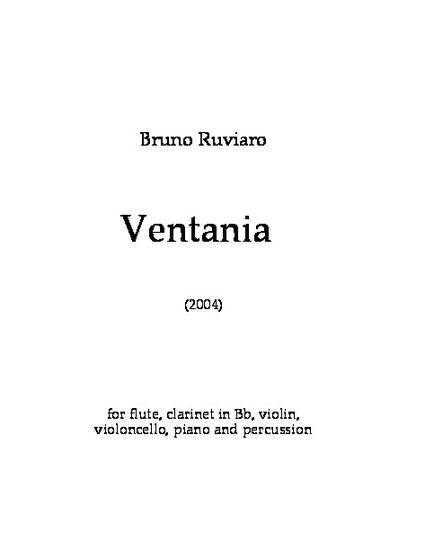 “Vento”, in Portuguese, means “wind”, and “ventania”, a particularly strong wind, Twenty-three surviving fragments of music are presented here, says the composer, in a somewhat uncomfortable explanatory tone, One after the other, he continues, As if they could possibly reconstruct all the other meaningful connections that were lost along the way, The wind has come and gone, someone oddly interrupts, at times no one seems to be paying attention, or is it just me, one can hear people arguing that the poem is about oneness and individuality, I wonder how much of that is rubbish and how much is true, although even the shape of it can be seen as the path of a falling leaf, That is for sure, she nods, and then they engage in a short conversation about this music being partly derived from speech, I don’t quite understand it, but I realize I should not insist on the subject. Flute, clarinet, violin, cello, piano and percussion. [ca. 13’00] Premiered by Ruckus Ensemble: Frank Cox (cello), Lisa Cella (flute), E. Michael Richards (clarinet), Tom Goldstein (percussion), Thomas Moore (piano), Brian Stone (conductor), Airi Yoshioka (violin). Stanford University, April 22, 2005.